Back in 2015, Tyler Winn of Cirrus Payroll won a Bizink website, which was a prize at the Thriveal CPA Conference. This was perfect timing for Tyler, as he was in need of a new website. The previous website had been built by a family member but it just wasn’t working for him. “Winning the website from Bizink was really cool. We really needed a new website and we’re very happy with this one” Tyler said. Tyler is fairly tech savvy himself and likes to do quite a bit in the backend of the site. “I do a lot, but I appreciate having Bizink’s support for the things that are above my paygrade” he explains. 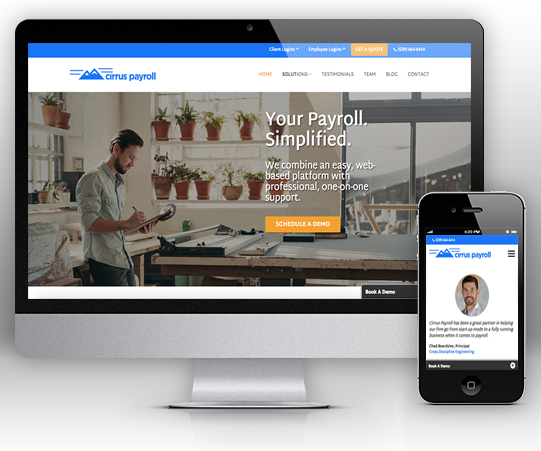 Cirrus Payroll have seen some great results since launching their Bizink site. “The blogging has been great. Before Bizink we didn’t have a site that was ranking SEO wise, we weren’t even on the first page of Google for a local search. After a year I ended up in the top three” Tyler explained. Now, Cirrus Payroll ranks first. “I give some credit to the templates you give us, and the content I was able to easily update on my own” he adds. “Before Bizink I didn’t have a good site and I didn’t know what to do really. Now I have a site that looks professional and is easy to update” he said. Check out the Cirrus Payroll website for yourself.